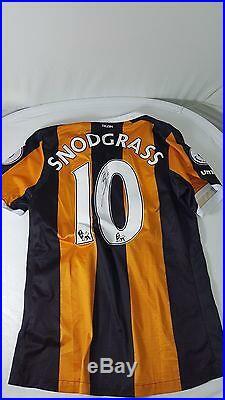 Match Day Shirt MATCH ISSUED AND SIGNED by SNODGRASS. This shirt was issued for, and signed by Hull City’s goalscorer Robert Snodgrass in the fixture against Southampton on 6th November. 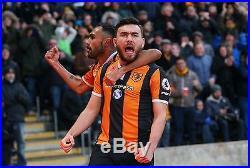 In this game Hull City won 2-1 with first half subsititute Robert Snodgrass scoring in the 61st minute. This is an unworn , match day issued shirt (the shirt was a back up in case the player wanted to change at half time). This shirt comes with a Certificate of Authenticity issued by Hull City. All proceeds from the sale of this shirt will go to The Royal British Legion and will help us to continue providing vital support and care to our Armed Forces and their families. Please note, these shirts are not for resale and we will only accept a maximum of 5 shirts per person. It is important to note that we will not declare any items out as gifts. Due to high volume of queries please expect a response in 1-3 days so please see the FAQs first. Why are there not photos of every shirt by all the players? In some cases, the clubs have been able to provide us with images of the shirts or with the players wearing the shirts on game days. However, as this is our 6th year auctioning the Premier League Shirts we can guarantee all shirts are 100% genuine from both the clubs and players advertised. For more information on The Royal British Legions relationship with Premier League clubs please visit. Why are there two shirts listed for the same player? In some cases, there are multiple match-worn shirts for the same player. We may also receive both Home and Away shirts for each player depending on whether the club has donated both games shirts to us, this will be stated in the title and further in the description. Will you include a certificate of authenticity? All shirts will come with a COA from the Club they have been provided by, confirming that the product is genuine. Will go to The Royal British Legion and make a real difference to members of the Armed Forces, veterans and their families by proving practical help, advice and support. Having Premier League clubs display the poppy on their shirts not only allows us to raise funds to support the future of the living but it has also helped us uphold the memory of the fallen. Why are there only a few shirts listed on my clubs page? Shirts will be posted on Wednesday 8th February. All Premier League clubs will be auctioning Poppy shirts played over Remembrance. Yes we Sky Bet are auctioning shirts from the Sky Bet Championship with 100% of the proceeds going to The. Please see the link below to find your team of choice. The Royal British Legion. 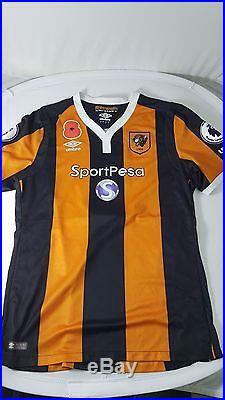 The item “Hull CITY SNODGRASS Poppy Premier League Match Day Shirt MATCH ISSUED AND SIGNED” is in sale since Thursday, January 19, 2017. This item is in the category “Sports Memorabilia\Football Shirts\English Clubs”. The seller is “theroyalbritishlegion” and is located in Aylesford. This item can be shipped worldwide.